SCP-3846, in typical form, as seen from the observation room adjacent its containment cell. Special Containment Procedures: SCP-3846 is to be kept in a 2x2x2 meter containment room composed of seamless concrete on all surfaces, with the exception of one (1) airlock-style entrance and one (1) reinforced plexiglass window. The airlock-style entrance is to be composed of two (2) electronically locked, airtight steel doors integrated into the concrete wall, spaced one (1) meter apart. At no point may both airtight doors be open at the same time. The plexiglass window is to be four (4) centimeters thick, and will allow researchers in an adjacent observation room to safely observe SCP-3846. The door leading from the hallway into this observation room must also be airtight. The containment room should be illuminated at all times with one (1) 50-watt light bulb. 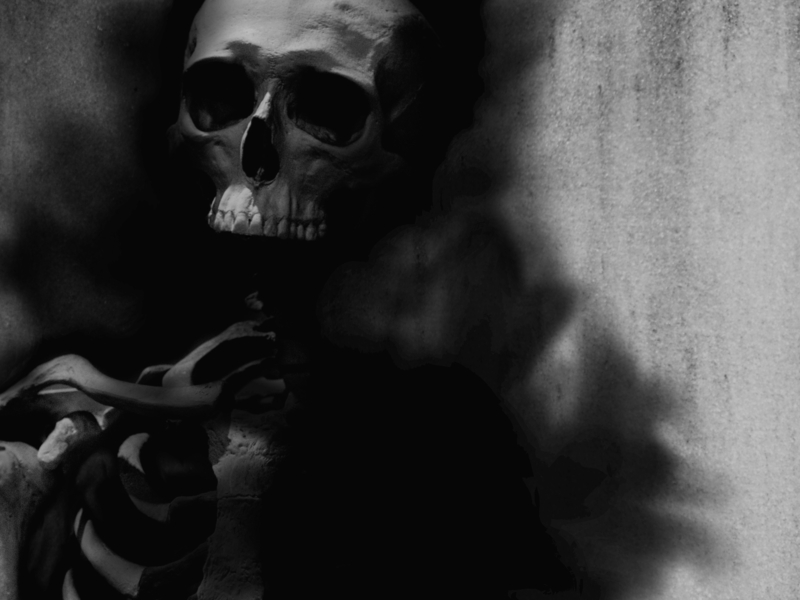 Description: SCP-3846 refers to an entity of unknown origin and composition which is most commonly observed as a dark gray, amorphous cloud of gas or fine particulate with incomplete human bone structure suspended within. The level of completion of the bone structure varies, but a partial skull and rib cage are almost always present. It is also possible for SCP-3846 to exist solely as the cloud with no bone structure at all. In such a state, it is able to surpass any non-airtight barrier. Under certain conditions, SCP-3846 may completely solidify into a complete replica human body, albeit lacking color. This, however, has only been observed in containment within a 24 day period following the sole containment breach event on 06/02/2000 (see Addendum C). The change between these states is voluntary, induced by SCP-3846 itself, rather than a matter of temperature or pressure in its environment. However, due to an apparent sensitivity to light, SCP-3846 is motivated to manifest a more complete humanoid form as light levels increase (see Addendum B). SCP-3846 was first reported on ██/██/1998 by an individual on the outskirts of the rural town of ████ █████, ████████████, United States, who made a distressed phone call to family wherein he described having encountered a "monster" after returning home from work that day. The following day, concerned family members from out of state arrived at the individual's home to check on him. The individual was found deceased in his bedroom. The body was badly contorted and had many large, open wounds. The home had no signs of forced entry and no evidence relating to a killer was found. The death was ruled an accident or homicide, and despite a brief investigative effort by police, the case went nowhere. This same scenario occurred to at least five more individuals, spaced 24-26 days apart. All victims were unmarried adults living alone in isolated locations within the same general geographic region. At that point, the apparent string of murders stirred attention from the media and state police. The Foundation had taken an interest due to the unusual circumstances. As a test, a Foundation field agent was placed as bait in an isolated house near the source of the reports, with MTF Epsilon-6 on standby nearby. The agent, who had a flawless mental background, reported having caught a glimpse of what he described as "a floating skeleton in a cloud of smoke" on ██/██/1999 after residing there without incident for the previous 21 days. MTF Epsilon-6 responded immediately to capture SCP-3846, which was then transported to its current containment arrangements at Site-81. Dr. Michael Sweets (Level 3) is currently overseeing all testing involving SCP-3846. Additional testing may be recommended by Level 2 or higher clearance personnel and conducted at Dr. Sweets' discretion. Procedure: SCP-3846 was transferred to a testing chamber capable of pressurization. It was exposed to high vacuum conditions for 15 minutes, followed by a sustained pressure of 50 bar for 15 minutes. Results: SCP-3846 moved about the chamber over the course of the 30 minute test duration, but exhibited no change of state. The gaseous component of SCP-3846 maintained its cohesion even in high vacuum, and high pressure likewise failed to have a noticeable effect. Procedure: SCP-3846 was transferred to a testing chamber with temperature controls. It was exposed to temperatures ranging from 35-500K over the course of two hours. Results: No change in solidity was observed. SCP-3846 appeared to huddle in the corner in cold environments while sprawling on the floor in high heat. Procedure: SCP-3846's chamber was fitted with a light bulb of variable intensity. Starting in complete darkness, it was gradually exposed to the whole range of the bulb's capabilities (150 watt maximum) over the course of 30 minutes. Results: At the lowest light levels, SCP-3846 showed no signs of solidity and did not exhibit any imitation bone structure. As light intensity increased (roughly 20 to 65 watts) the rudimentary elements of a torso and head became visible, including a rib cage and skull suspended in the dark gray mass of gas. At roughly 65-90 watts, SCP-3846 did not exhibit further changes in state, but began moving around the room more erratically. Beyond 90 watts, it underwent irregular mutations - forming bones, limbs, and organs that were not correct human anatomy. These extra body parts would not persist, however; they would frequently dissipate back into the mass of gas and be replaced by new random mutations. Its state remained unstable and its behavior remained erratic as light intensity continued to increase up to the maximum 150 watts. Researcher's notes: Now we're onto something. Lights at the high end of normal household use had a clear negative effect on 3846. Could it be that light induces changes in SCP-3846's composition - perhaps painfully so? More testing might give us the answer. Procedure: SCP-3846 was transported to a testing chamber that was divided down the middle by a watertight, but not airtight barrier. It was released into the side of the room which had a 100 watt light bulb. The other side of the barrier had no lights. Testing began when the light was turned on. Results: SCP-3846 became gaseous within seconds, and passed through the barrier to the darker side of the room. Researcher's notes: Despite the higher-intensity light (in the random mutations range observed in the previous test), it kept strict control of its form and turned completely gaseous in order to escape to the darker side of the room. This contradicts any hypothesis that the light itself causes changes in state, and suggests that they are instead voluntary changes that are nevertheless made in response to light. Procedure: A speaker was introduced to the containment cell. From the observation room, junior researcher Dr. ███████ asked SCP-3846 basic questions such as "SCP-3846, can you understand me?" Results: SCP-3846 turned towards the speaker, and continued to keep its attention on the speaker for the duration of the test, but made no obvious attempts to vocalize or otherwise communicate. Procedure: D-3846-01 was introduced to SCP-3846's containment cell to observe its demeanor in the presence of a human, and identify any potential memetic effects close contact may have. SCP-3846 did not interact with the subject during 20 minutes of close proximity. The subject suffered no adverse affects and SCP-3846 made no apparent attempt to harm the subject. Researcher's notes: Admittedly, we didn't really know what would happen here. There was definitely a chance that 3846 would kill that D-Class just based upon what it was doing to people in the wild, but that didn't happen in a controlled environment that has been designed to suit it. Procedure: D-3846-01 was given a glass bottle and introduced to SCP-3846's containment cell. Subject was asked to try to seal a sample of the gaseous component of SCP-3846 inside it for analysis. Results: Subject approached SCP-3846, nervously, while holding the bottle. SCP-3846 avoided the subject. The subject was ordered to be more aggressive to acquire the sample. The subject lunged at SCP-3846 with the bottle, and for a moment appeared to have captured a sample, but the subject was physically unable to remove the clasped bottle from the mass of gas until he unclasped the bottle. Subject was allowed to leave the chamber, rather than prod SCP-3846 further. Researcher's notes: Damn! I really thought we could snag a sample of whatever it is that "makes up" 3846. Though I'm glad we didn't make the D-Class keep trying. No sense in prodding something potentially dangerous, even if it has been quite docile since capture. Procedure: Procedure from test 04 was repeated. Results: Up to 65 watts, SCP-3846 behaved exactly as in test 04. Beyond 65 watts, SCP-3846 formed a complete replica of Dr. ███████, matching the description from the containment breach report. SCP-3486's behavior was calm, in contrast to the erratic behavior seen in test 04. Researcher's notes: Although it was only possible due to the unfortunate fate of Dr. ███████, this result is very exciting. Light, at moderate or high levels, causes distress to 3846 - unless it is able to solidify completely into a human form. In order to do that, it has to have recently "studied" a human form. The pattern of attacks in the wild now make perfect sense. But the attack on Dr. ███████ itself still doesn't make sense; what would prompt it to kill a man if the light levels in its cell are so low that it shouldn't need to create a human form? Its motivations may be more complex than I've given it credit for. Procedure: Test 05 was repeated, albeit with Dr. Sweets asking the questions. For the duration of the test, the 50 watt light bulb in SCP-3846's containment cell was replaced with a 100 watt bulb. Dr. Sweets: Hello? SCP-3846, can you hear me? Dr. Sweets: Uh… okay, SCP-3846, if you can understand what I'm saying to you, please look at me - I'm through the glass. Dr. Sweets: My god - you can understand! Three-eight-four-six, can you tell me where you came from? And are there others like you? Foundation linguists and codebreakers have been unable to decipher the recorded audio of SCP-3846's vocalizations. When SCP-3846 was first captured, its containment room window was 1 centimeter thick. On 06/02/2000, SCP-3846 shattered the window leading into the adjacent observation room and killed a junior researcher, Dr. Andrew ███████, by means of crudely opening Dr. ███████'s abdominal cavity and head, and sorting through his innards for less than a minute. SCP-3846 then proceeded under the door of the observation room out into the hallway. SCP-3846 had taken on a humanoid appearance once it entered the hallway, which was well-lit beyond what SCP-3846 would normally tolerate. Its appearance was described as a silhouette-like black human figure that resembled Dr. ███████ in height, build, and what little facial features could be easily seen in spite of the lack of color. No gaseous component was visible. Its behavior at this point was neither aggressive nor escapist, as it merely walked at a brisk pace for a short distance before responding security personnel arrived and recaptured it without incident. SCP-3846 was sent to a temporary containment room elsewhere, while its usual containment room was being repaired. We've upped the thickness of the plexiglass window significantly, which should do the trick. We have no reason to think 3846 is abnormally strong - I think we were just too concerned about the room being airtight and not concerned enough about whether that thin window could get bashed in. In any case, the new airtight door installed in the observation room is more than enough of a failsafe. In light of this event, I will be suspending any planned testing involving human subjects in direct contact with SCP-3846 for the time being.